Awhile back I won a pack of solid color charm squares at a Portland Modern Quilt Guild meeting. We had a charm square swap at the same meeting, and while I lovingly go through the pretty printed charm squares I got, I haven't had any particular thoughts on how to use them. The solid charm squares though, I was inspired to use right away. If you're curious, I made the arrows by cutting each charm square (which is 5 x 5) in half, and then cutting one of the halves to be 4.5 to use in the flying geese (goose?) half. Here's a diagram of a finished arrow unit. As far as the name goes, it came from a book my brother had called Mad Mazes. 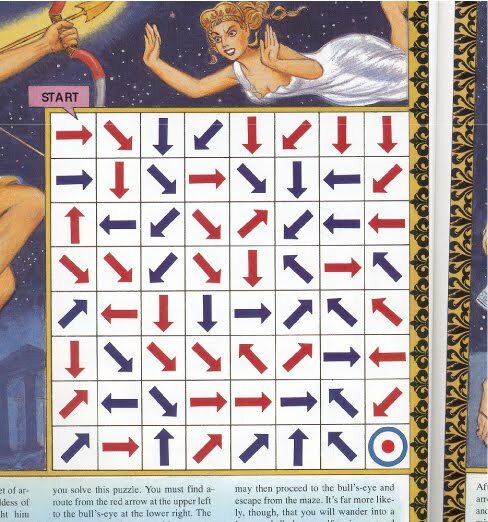 It had a set of mazes that were made up of arrows, and the story that went with the maze was something about Apollo and Diana. I couldn't find many photos of it online (and the book is at home so I can't scan it) but this is one of the puzzles. 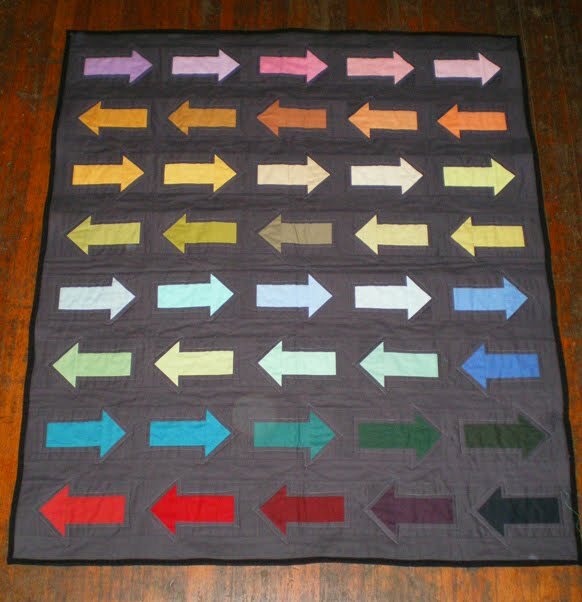 I don't recall the rules off hand, but I like all the arrows. 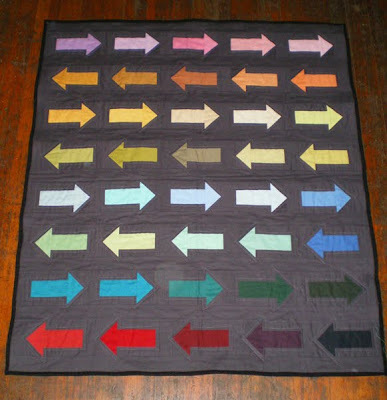 I had 43 charm squares, and if I'd added two more colors it would have made almost a perfect crib sized quilt, but I chose to leave out three of the arrows. 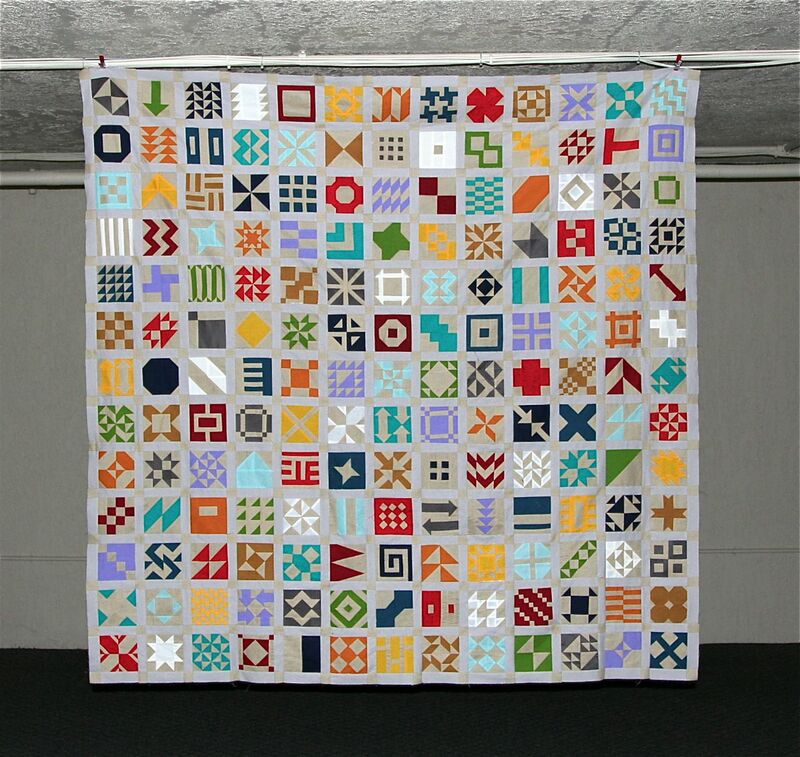 The finished size is around 44 x 55, which is a little odd, but I think it will make an okay lap quilt. 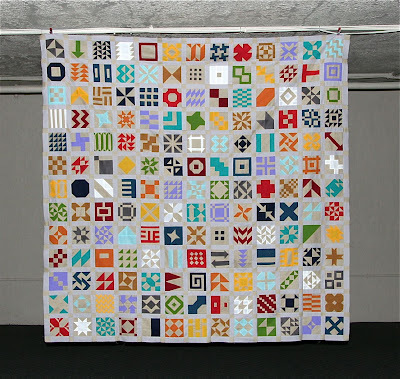 I've been working on it at camp, and it's been a different experience working on a quilt in a semi-public space. Other staff members will sometimes come by and chat while I'm working, or ask questions. I'm glad that I finally broke and brought my sewing machine. I have too many ideas rolling around in my head not to sew for the 2 months that I'm working here. The view makes up for the fact that I'm sleeping in a bunk bed all summer. 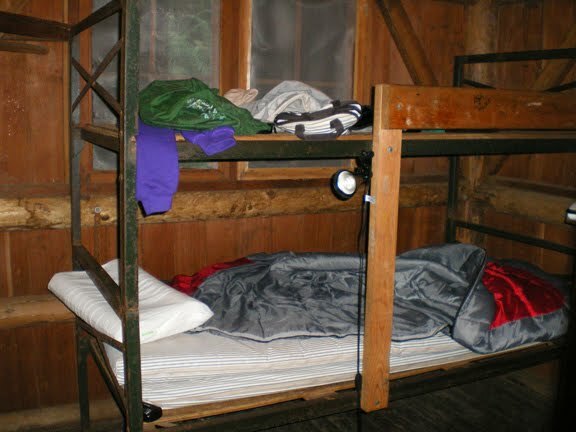 Although, since it's ten degrees cooler here than in Portland, and it always cools down at night it's a pretty sweet set up. I work in this building. Not to shabby. 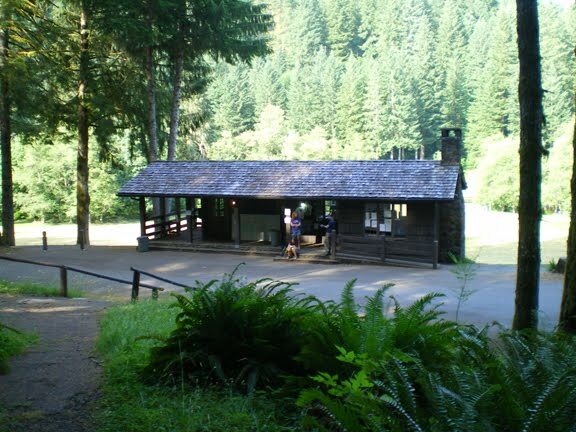 The whole camp was built in the 1930's by the Civilian Conservation Corps, so everything is very lovely, as is the whole Silver Falls State park. 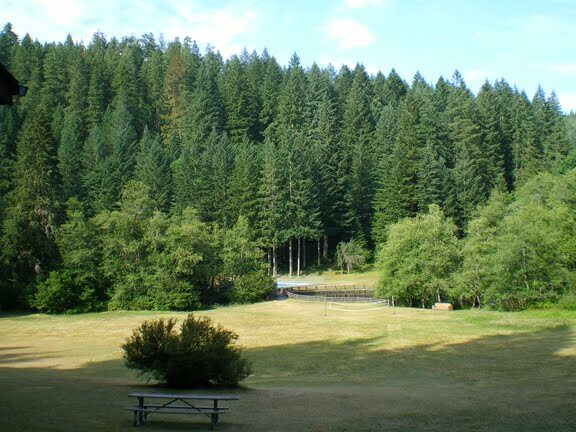 I can't believe there are only four more weeks until I'm back in Portland and back to a normal life. Summer always goes by too fast. The last step of the Hey Cherri top was adding the flying geese border. It was a pretty intense project, but I'm glad I did it. The whole process was pretty satisfying, and a big creative stretch. Here's a photo of the finished top. I almost like the boarder better than anything. I'm very drawn to the flying geese blocks for some reason. The following is an e-mail exchange between Cherri and myself. My words are in blue, and Cherri's are in red. We are talking about the sampler quilt I am making. Whoa.....those are some very cool blocks! It is amazing to me that you can think up more and more designs. Do you dream them up at night? Do you fold little squares of paper to get design ideas? Do you doodle nonstop? I am totally in awe of your design skills! I mainly just doodle! I also did a lot of visual research through flickr and google images. A lot of the designs just seemed to come from simply having half finished blocks in my hands. A new way to arrange them would suddenly become apparent. I'm not claiming that any of these blocks are original, even though I feel like some of them came about without any visual reference. I'm sure that someone else thought of these things before me. I still can't believe that you will be separated from the blocks and your sewing machine....how, oh how, will you ever cope? Urg! I'm leaving so soon, so I'll let you know! I debated setting up some sort of hand work, but the more I thought about it, the less I wanted to. We'll see as the summer goes on. Oh yeah, got them all together now! Now let's see if I can get the border done by Thursday (debatable!) It's so different for me to see it as a photo, rather than just a computer image. It would have been a lot easier to blog this as I went, as the further I get from it, the less I have to say! I've been out of Portland for almost a month now, and am wondering where the time went. I don't want to leave camp! It's so beautiful here. I wish I could work year round. So much has happened at camp already, but the most photogenic is that there was a camel brought to camp for the kids to see. This was my expression when I saw the camel. As you can tell, I was pretty unimpressed. The following is an email exchange between Cherri and myself. My words are in blue, and Cherri's are in red. 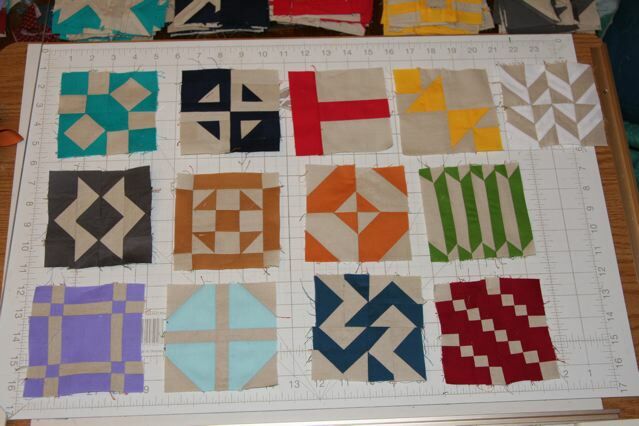 Cherri has made it to Alaska for the summer at this point, and I am struggling to finish all the blocks for quilt. We got our Internet working here......hooray! 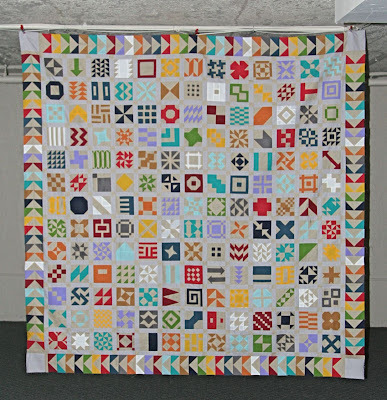 The house wintered just great and I am all ready to sew.....first up, a baby quilt for a new family that is moving here in 2 weeks with a brand new baby. I happened to buy some organic cotton ( a first for me) that features sand dollars, sea urchins, anemones, and seaweed.....all good for an Alaska baby quilt. Is is cloud nine fabrics? Their sea collection is very nice without being too beachy. It's been cold and rainy here, so I hope Alaska is a little nicer. I'm hoping it will warm up soon. I've been toying with the idea of doing something like posting a block a day on my blog with directions after I come back from camp in the fall, and making it all over again. We'll see how I feel when that time rolls around. When I look at these blocks now, I quite like them. I'm a little surprised that I'm not more inspired by them. 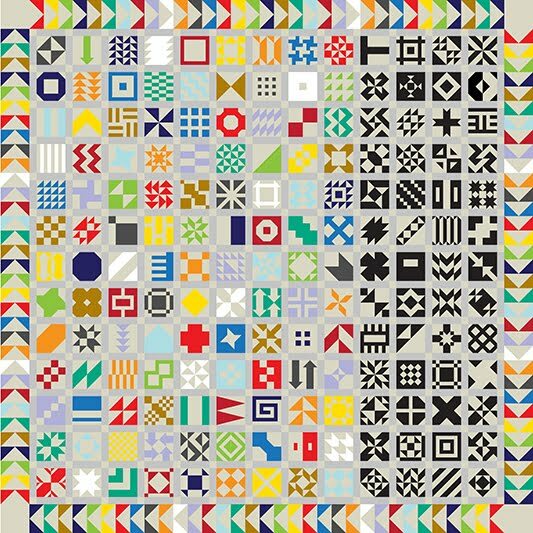 I like them all as a group, but I don't see them used in individual quilts yet. An email exchange between myself and Cherri. My words are in blue, and Cherri's are in red. What if you did the triangle border with each triangle in just one solid color? 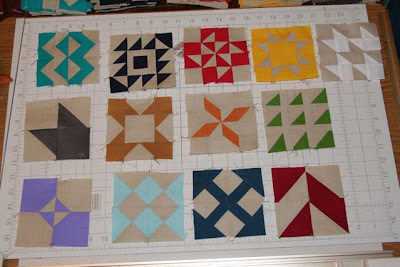 12 different colors and your background color Except for the corners which could be fancy pieced? The triangles could alternate with your cream color. Oh I don't know now....maybe that is too boring especially after all those glorious blocks! Heh. I don't think it would be too boring. I'm getting pretty attached to those flying geese though. 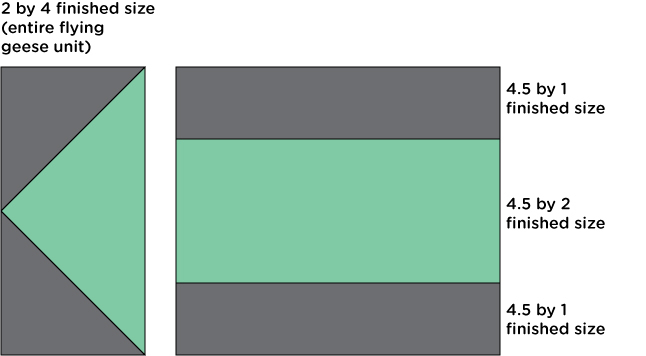 I think the real issue is that while you could make the types of triangles without a specialty ruler, (by folding in half and cutting corner to corner) you end up wasting a lot of fabric. I did a few, but I didn't like anything as much as the geese. When I'm finished, I'll whip up a few alternate border looks. When do you leave for camp? I leave on the 19th, so I've got to get moving! 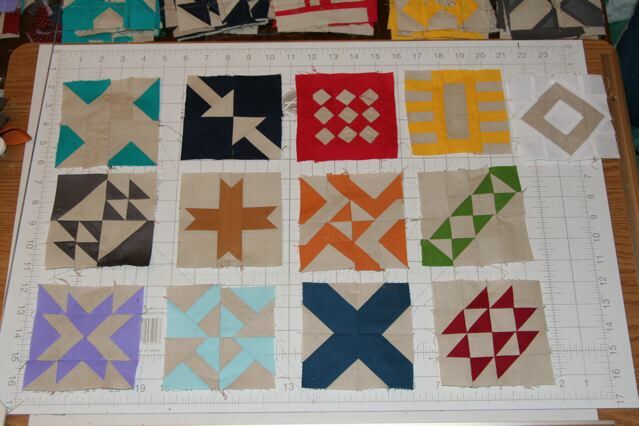 I'm not sure I'll make it, but I at least want to get the blocks finished. I hope your travels to Alaska were safe and fun! I really think you should consider starting a blog or flickr accounts so I can drool over all your neat projects and scenery! Oh yeah, an update! We're on to 117 blocks (9 sets finished out of 13). I've got the final selection of blocks mostly picked out, but if I think of some better ones I'll replace some of the ones I don't currently like. I've sketched out around 200 blocks now, which is nice because it means I can be a bit picky, but I'm still not totally happy with the blocks I have. I'm still hoping to take an actual physical picture of them all together, but it's getting to be such a hassle that updating my computerized version is much easier! By this point in the process, I had enough blocks, but not enough blocks that I liked. Luckily, as I made more and more blocks, new blocks would come to me, allowing me to eliminate blocks I didn't like as much, or that seemed more complicated. I wish that I'd had more floor space in my apartment, so I could have spread out all the blocks, or rather I wish that I'd realized I could have just snuck down to the shared meeting room for my building and used the ample floor space there.